HGA has won two AIA Minnesota Honor Awards for architectural excellence. 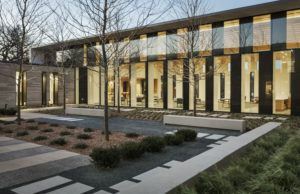 The annual Honor Awards program recognizes outstanding architecture and urban design, design invention, attention to detail, and advancement of sustainable design by AIA Minnesota members and member firms. 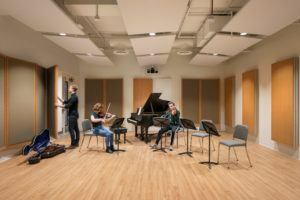 Carleton College Music and Performance Commons—This addition to the college’s Weitz Center in Northfield, Minnesota, integrates the Music department with the Theater, Dance, Cinema, and Media Studies departments into a single facility that includes a 400-seat Performance Hall, rehearsal spaces, teaching studios, and faculty offices. Temple Israel Expansion—This modern expansion to the classically inspired 1928 Temple in Minneapolis includes a lobby and event space, courtyard, re-imagined Early Childhood Center (ECC), and new religious education classrooms for grades 1 – 12. The 2018 Honor Awards jury included Marlon Blackwell, FAIA, Distinguished Professor and E. Fay Jones Chair in Architecture at the Fay Jones School of Architecture at the University of Arkansas; Allison Grace Williams, FAIA, Founder of AGWms_studio and Adjunct Lecturer at Stanford University, Palo Alto, California; and Kim Yao, AIA, Principal, Architecture Research Office, New York City. For more information, visit AIA Minnesota.